Linas Jegelevicius is a Lithuanian writer who obtained his degree in journalism from Vilnius University's Institute of Journalism in 1995. During 1995 and 2005, he lived in New York and Miami. 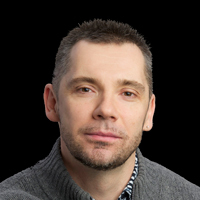 Since returning to Lithuania in 2005, he has worked as an editor and director of several regional newspapers. Mr. Jegelevicius is currently editor-in-chief of Palangos Tiltas, a newspaper published in the Baltic resort of Palanga, as well as of The Baltic Times, the longest-running English-language print publication in the Baltics. He is also an active freelancer for numerous English-language publications, including bne.eu, tol.org, bnn.lv and others. He has published three books as well. Mr. Jegelevicius' interests include politics, European Union policy, sports, journalism, languages and traveling. TV comedian Volodymyr Zelenskiy is leading in the race to be the next Ukrainian president, thanks to his populist appeal. But who will get the last laugh: his supporters or his critics? The World Cup has turned attention in Russia and abroad away from the country's political and economic problems. Once the soccer frenzy dies, though, Russian President Vladimir Putin will have to face the music. Russia's presidential election is March 18, and the odds are stacked in the incumbent's favor. But in an interview with Stratfor contributor Linas Jegelevicius, one prominent opposition figure warns that no race can be predicted with utter certainty. In an interview with Stratfor contributor Linas Jegelevicius, the former EU ambassador to Russia discusses how Moscow and the West can move past their standoff toward a more constructive relationship. Many migrant workers in Eastern Europe have left their homes to eke out a living in countries that promise better chances of employment. But rarely do they find the land of opportunity they expected. In an interview with Stratfor contributor Linas Jegelevicius, Lithuania's defense minister warns that the approaching Zapad military exercises may not be as innocuous as they seem.